This is the IWSG post for March. 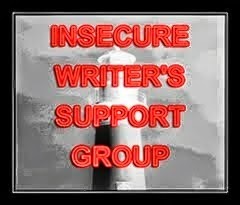 The IWSG is a great group for writers at all stages, where we commune and discuss our writerly insecurities every first Wednesday of the month. March's co-hosts are: Lauren Hennessy, Lisa Buie-Collard, Lidy, Christine Rains, and Mary Aalgaard! Years ago, a writing professor told me that the more I wrote, the more I read, the more I might not enjoy reading for the sake of reading as I used to, that writing more seriously would change the way I read things. Y'all, it's happened. I mean--it's been happening. I know it has. It's not that I've grown pickier over what I read--seeing what I've been reading laid out on Goodreads has actually shown me my own reading habits and forced me to go and find other things to read. But I am a lot more critical of what I read. I decided to review every book I read this year, when in the years past, I only reviewed the ones I felt compelled to. I read a historical romance last week and while the story was entertaining and I liked the lead characters, I was also mentally noting, "Hmm. Head hopping. Oh, omniscient point of view. Info Dump! Stilted dialogue. Really, would that character do that?" A few weeks prior, I was reading a historical fiction called Tidewater when there was a sequence of sort-of supernatural-ish bits. They were there to illustrate the belief systems of the 16th century Native American character, but they stood out compared to the more authentic and grounded rest of the story. None of this is to say that my writing, though it's come along, is perfect. Pearl's first chapter is a bit info-dumpy. A short story I submitted last month for an upcoming anthology (The Thing That Turned Me--out May 31st!) definitely needs some editing and perhaps a touch of rewriting. Plotting is still a challenge. Finding the not-so-great bits of your own writing doesn't happen as easily as finding it in someone else's. But having your writer helmet on while reading is super useful--but then again, if I'm reading something that blows my mind, the insecurity bell goes off in my head. I do pick apart what I read sometimes. I've been doing it for a long time. Books, movies, plays. There's no telling how many tangents friends and family have been subjected to over the years. That said, if something is amazing, I just go with it. After all, nothing is ever perfect. I'll forgive a lot of grievances if the story is good enough. One of my most favorite books of all time has this stupid scene in it where the main character starts speaking Italian for no reason, which of course the author has to translate, and to this day I still think it's pretentious and pointless. Kind of makes me wonder why she thought that was a good idea. The character wasn't Italian and up until that point, there was a bunch of fragmented French in the book, which now that I think about it, also makes no sense. Wait, so the character wasn't Italian, didn't speak Italian up to that point, so...why was that there? Weird. I notice that I pick apart romance novels the most these days. Maybe because I've read them all this time, so I kind of know what the formula is. It happened to me too. I enjoy reading--I love it--but my brain is definitely still going as I read and that can be annoying. It's less likely to do that in genres I don't read very much of, though, so I'm going to read some fantasy next. Seconded. But when I read something that blows my mind, I also pause to analyze what it is that got to me. Was it the concept? The characters? The way the story was told? It usually boils down to character for me. If I don't like the characters or the way they evolve, I will throw the book aside. I agree--it starts with the characters. It starts that way in writing them for me, so it makes sense that it would be that same thing that often grabs me. It's happened to me too. I feel tempted to write notes in the margins of books about where the author could have tightened up the prose or tweaked some character development. I miss the days where I could lose myself in a novel. When I read something great, I find myself going back and looking for how the author built the story so well. Word choices jar me a lot. "Why did they choose that word? Why not that one?" When I read a novel that carries me along and I love, I try to figure out why I liked it so much, too. I read a book last week that had headhopping--I think it was in omni, but it was written pretty recently, I think. I notice filtering a lot more now. So wonderful you are part of that anthology, too! I notice those things, but what I really notice is how well a character grabs me. If it's not a really compelling character, if I don't relate, it dumps me out of the story so fast. Yeah, for me, I need to be able to know what or how the character is thinking or else I can't relate to them or the work itself. I do this kind of thing more in movies. Saying things like: must be the midpoint twist. I just don't see stories as stories anymore. I think it's easier to notice it in movies because the plot and everything is a little more compressed than a book. One of the writers I mentor told me recently that she saw a kids show and began picking it apart, pointing out what didn't make sense, much to the annoyment to the company she was with. She realized she had me to thank for that, as I kept challenging to break a story apart and really understand what things were. Now she's learning how to turn it off. I can't help but analyze what I read or what I watch, and I love that about myself, but it also means I can't just enjoy something for the entertainment its meant to be. I've come to accept that about myself. As I say to my proteges, it is a blessing and a curse. I notice it especially with dialogue. If dialogue seems really contrived in a movie or TV show, then I hear it and I'll start picking it apart. Yes. That happens. As we get more educated in our craft, we read or watch with a critic's eye. Yup. It certainly does happen. Yep. It's gotten worse (or better) since I started publishing, actually. Thank you so much for your comments and thoughts. Check back soon. I reply to all comments. Happy reading! 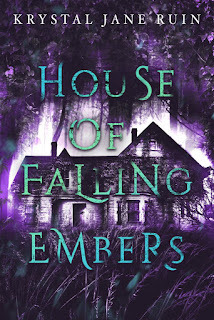 Interview with House of Falling Embers author Krystal Jane Ruin! My friend Krystal Jane Ruin released her fourth book on October 1st and I finally finished reading it a few days ago! As per tradition, I asked her a few questions about the story! House of Falling Embers is available at Amazon, Barnes and Noble, Google Play, and other online retailers! My plot bunny--which has been hopping around since about October, I think--is sort of shaping up to be a historical fiction/alternate history/contemporary dual storyline/time slip/romantic elements kind of mishmash thing. As my friend Krystal Jane Ruin says, it's turning into a FrankenIdea. I don't have a ton worked out about said Plot Bunneh--I don't even have characters' names yet--but I do know that the story revolves around an English country house. Or stately home, if you prefer. I'll go with country house because I don't think the house in my Plot Bunny is a huge palace-like mansion which is what "stately home" says to me. I am a pretty deep Hamilfan, y'know? I saw Hamilton in 2015 (still bragging), I watched the PBS Hamilton documentary twice, I'm currently reading the annotated Hamilton: The Revolution book on my Phone's Kindle app. My nieces have recently gotten into Hamilton, but not because of me. Niece #1, aged 10, got to see Hamilton on Broadway with her aunt for her birthday. When the nieces went to visit friends this summer, said friends' children listened obsessively to the Hamilton cast album in their car. They came back knowing the songs and being excited about Hamilton's story, like so many others. Their parents even took them to Weehawken, a New Jersey town across the Hudson from Manhattan, where Hamilton and Burr's fateful duel happened in 1804. And I'm up to the "Ten Duel Commandments" chapter in the Hamilton book. And it's been a while since I've ranted about something historical. Michelle has read 1 book toward her goal of 20 books.